That’s one of my biggest complaints about being a food blogger…when I am writing my posts I start immediately craving whatever it is I am talking about. And for the sake of my pants, I can not make a whole cobbler at 11pm on a Sunday. I ended up eating a handful of dried banana chips and trying to pretend they were just as gloriously delicious as this berry cobbler was. They absolutely weren’t and I am pretty sure I will be dreaming of going swimming in a cobbler tonight. 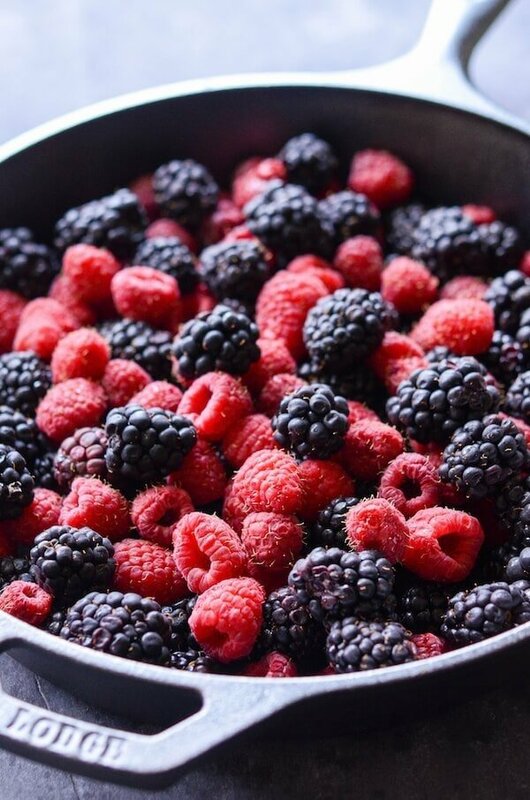 Blackberry & Raspberries are by far my favorite berry combo. While we don’t really have raspberry picking here in Florida, we do have blackberry farms and in just a couple of months they will open for picking again. Last year I made a gorgeous Blackberry Sorbet with all my fresh picked berries and the year before I made Blackberry Pie Bars. I can’t wait to see what I can whip up this year. I am thinking muffins. I can’t wait for the girls to get just a little older to really enjoy going berry picking with me. I might go ahead and take them this year…even though I know they will leave stained purple and terrorize all the other pickers. 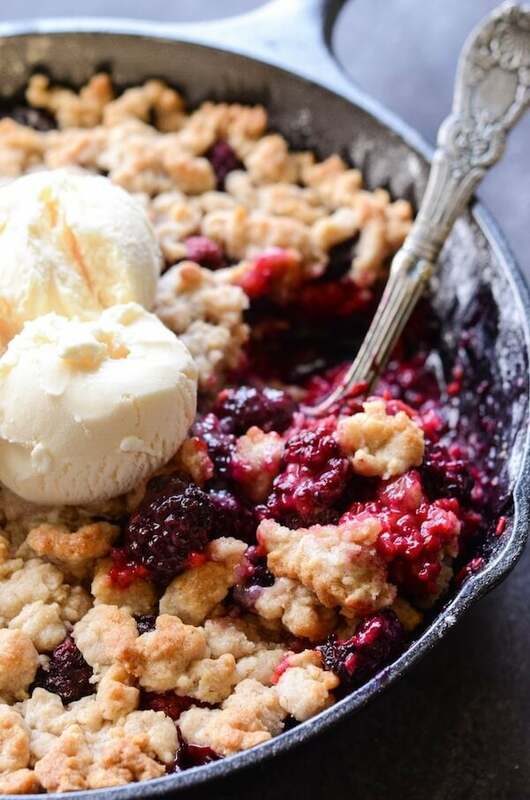 I have always been a berry cobbler addict — check out my Best Classic Berry Cobbler circa 2014 — and I think I might have actually made a better berry cobbler! Shocker, right? This recipe is the same base recipe, but instead of being topped with pie crust, it’s topped with a crumbled buttery topping. And it is like the perfect topping ever for a berry cobbler. Seriously, you must make this immediately. In a 10 inch cast iron skillet, toss together berries, sugar, 1/2 cup flour, cornstarch and salt. Smooth berry into an even layer. In a stand mixer with paddle attachment, add the 1 cup flour, oats, sugar, salt and cinnamon. Add the butter and mix until texture is coarse clumps and mixture will hold together in clumps when you squeeze it with your hand. Spread topping evenly on top of berry mixture with your hand and press it down lightly. Bake for 35 to 40 minutes, until the edges are bubbling and the top is golden brown. Serve warm with vanilla ice cream! This cobbler is seriously stunning! I could stare at these photos all day long! And that is how I am going to eat it straight out of the skillet! Your photos are gorgeous, and I’m seriously drooling here — yum! All of these pictures are killing me! Looks super delish and love the skillet aspect. Fabulous! I sure wish this was sitting in front of me right now! I would devour it! That first photo just made me so happy. All I can think about is cobbler now. I think I’d need a lifetime supply to ever have enough of this stuff. Looks absolutely AMAZING!! 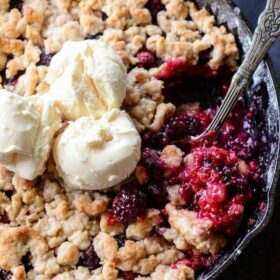 I’m such a sucker for a berry cobbler! This looks fantastic! My first reaction was “I WANT”!!! This looks amazing! 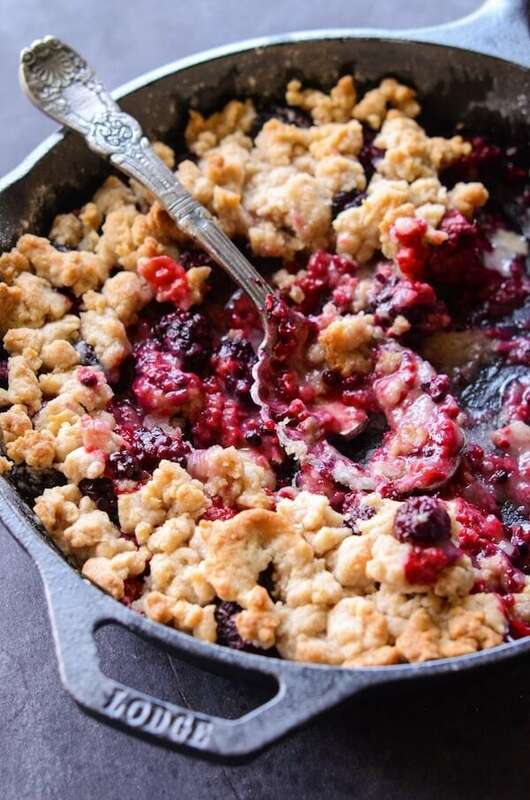 I love the idea of making a cobbler in your cast iron. Beautiful! I will never say no to delicious cobbler! Definitely want to dive in! I need to make this as soon as possible! I can’t resist berries and that crumb topping is calling my name. This is one seriously gorgeous cobbler. We have loads of fresh berries on hand, so I think I know exactly what I’ll be making tomorrow. This looks SOOOO good. I just made a blueberry cobbler a couple weeks ago and I feel the same way. I miss it so much. Berry cobblers are DELICIOUS!!! I want to eat it all myself!! Gorgeous! Hi Jessica!! Your cobbler looks AMAZING! This was delicious! I chose to make it as my birthday dessert and served it under vanilla bean gelato. Soooo good! Thank you. So glad you liked it — vanilla bean gelato?? YUM! Thanks for taking the time to come back and comment how it turned out for you! The recipe calls for flour in two places. Half a cup then, one cup. Which is It? How much is needed for the recipe exactly? Thank you for clarifying. Hi Maria! The first 1/2 cup of flour gets tossed in with the berries. The second 1 cup of flour is used in the crumb topping. 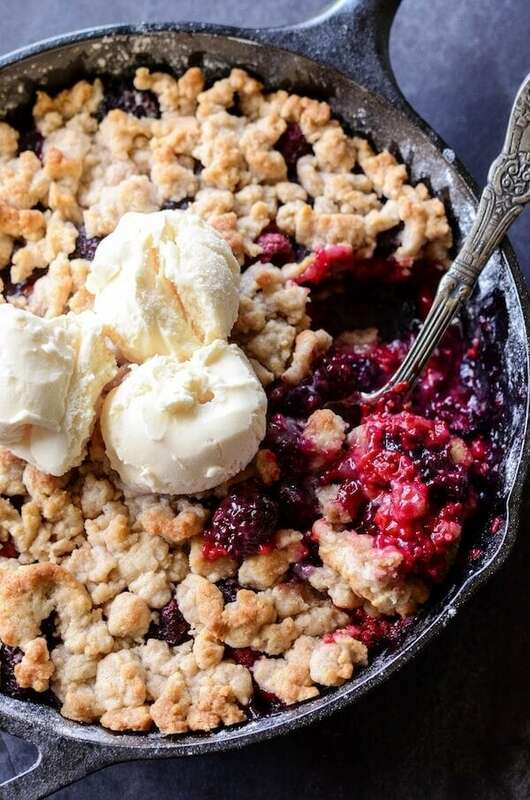 Is it possible to make this cobbler with frozen berries? Hi! This looks delicious, but I’m making it for a friend. Can I cook it in something other than a skillet and have it turn out the same? Like a regular 9×13 baking dish or something? I appreciate the help, thank you! Hi Marissa! Yes, it should turn out just fine in a regular casserole dish. But you would need to double the recipe for a 9×13. The recipe as is would fill a 9×9 baking dish well. If there are leftovers, how would you store it? I store any leftovers in the fridge to be on the safe side, then reheat in the microwave for a few seconds before serving! I would love to know where you got that serving spoon in the picture…it adds the right touch! Thank you! Hello! I made this for thanksgiving and it was amazing!! I did have one issue though… there was so much sugar in the berries beneath the crust that the sugar literally solidified in spots and I had to soak :shudder: my cast iron pan lol just to get it off! It seemed like a pretty considerable amount of sugar, too. Other than that, this recipe was TO DIE FOR. I plan on making it again for Christmas morning.. any suggestions for me? Thank you!!!! I know it seems like common sense to simply add less sugar, but then I’m worried about that sugar also solidifying and not having enough in the berry mix. Thanks! Hi Sherri, I wonder if it was actually the cornstarch/flour that did that instead of the sugar? Maybe it wasn’t mixed well enough? However, you can definitely reduce the sugar to whatever you would like. It is not required. You can even leave it out if you prefer a tart cobbler! Could I use quick oats?